support during her life with us. Boe was adopted by my brother-in-law John Otero in 1999 and later that year we moved into John's house with our 2 dogs and fell in love with Boe. Needless to say later that year when we moved out we moved Boe with us. We were a family and we lived as such for 11 years. On wedn June 30th 2010 our beloved "old man" suffered from Gastric Torsion and passed away, in typical "Boe" style, one minute being as hyper as a pup and the next our boy was in pain and then gone. Our family and John miss him very much and hope to see him again someday. BoeJoe we miss you. Watch over us until we meet again. We love you Boe. John, Mike and Dawn. Duncan, it's been one week since we have been without you and not a minute has gone by that we haven't thought of you, or that I haven't cried for you. No animal should have to be faced with what you went through, but I find a small amount of comfort, knowing you aren't in pain anymore, but am still selfish that you can't be here with us. You were our first baby and I'm glad that we had 9 1/2 wonderful years together. You brought a huge amount of joy to our lives (and still do ) and to the girls. You were such a good protector to them and even to other babies that would come to our house and I know that you are still watching over us. We love and miss you dearly. Mick, Jen, Emersen & Addisen. Dooney you were so loving. You gave such sweet kisses to your new human friends. You actually managed to get through the doggie door. You walked on my shiny slick floors. I have perfectly healthy foster dogs that can't handle the slick floor and doggie door. You even tried to lay on top of my gym bag last night. You were so loving to your new human friends. You gave such sweet kisses. We will miss you Dooney. It really wasn't supposed to end this way little girl, your chicken livers are ready now. Dooney you're such a precious soul. You must have known that you were finally home. 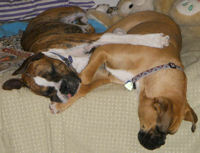 Just 7 months old, Dooney passed away early this morning with Aspen by her side. Dooney died in her sleep September 3rd, 2009. Dooney, your chicken livers are ready. We were hoping to spend Christmas with you. We wanted to swaddle you in warm blankets forever. Your beautiful eyes with the blue reflection. We were hoping for another success story like Paco. and that your journey had come to an end. You finally found someone that cared. You wanted to know what it felt like to be loved. We loved you with all of our hearts. We selfishly wish you were still with us. 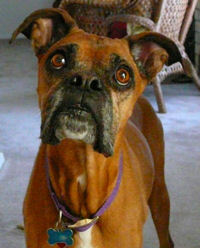 Mia passed away on August 6th 2008 after being diagnosed with a heart based tumor. I believe she held on for those of us who loved her even though she knew she was ill, because that was the kind of dog she was. I will never forget how fast her little tail would wag at the mention of Mike & Dawn or Grandma & Grandpa or any of the little nieces it didn't matter she loved them all. She loved to sleep on the bed with me and nudge her way under the blankets when she was cold. She was able to do things like open the dog door when I forgot to open the slide for the dog door that will forever keep all of us wondering how she did it. She climbed on tables like a cat because she had to be able to see outside. She loved going on walks, to the dog park and on rides. She rarely got off of the couch without keeping her back legs on long enough to stretch out first. She liked laying around being lazy but also loved to play and rough house. 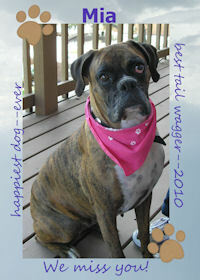 She was the best dog I have had and was a great companion. She was loved by all that had the pleasure to know her. Those that did get to love her feel blessed to have been able to have been part of Mia's life and for Mia to be part of theirs. 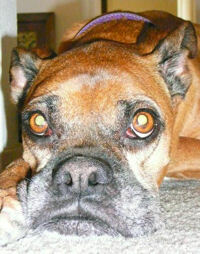 I have never known one dog that has touched the lives of so many others and forever she will be missed. Watch over me and all the others who loved you until we meet again girl. RIP Mia we will all miss and love you always. Little did we know that 3 yrs ago, the most beautiful heart would come into our home and show us love we have never witnessed before. The first time I laid eyes on her was at AHANM on Virginia St. 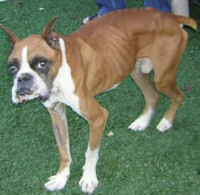 I was horrified at the sight of this abused, surrendered boxer. Squiggles was her name and she was not a good looking dog. Thank goodness we were only fostering her. Every morning for the first two weeks I would have to drag her outside to go potty. She was afraid that she would be left outside. She soon got the idea that this was a loving home and that dogs go in and out as they please, sleep in beds and on couches and get lots of toys, kisses, hugs and love. 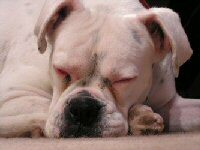 We soon changed her name to Trista, Squiggles was such an ugly name, since she wasn't a good looking boxer ( I know what your thinking, "How mean!" 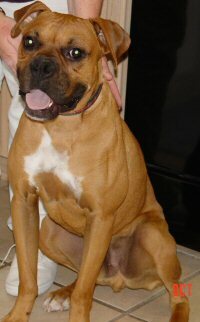 she really wasn't a pretty boxer) the least we could do is give her a beautiful name. Both eyes were droopy, her bottom jaw jutted out so much that both bottom teeth showed, she couldn't fit her tongue in her mouth it was so long and she had no pigment in one eye so it was always red. 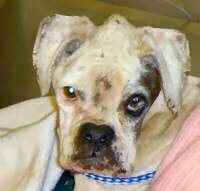 After several weeks my husband told me to give Doug a call and tell him we wanted to keep Trista, my husband didn't want the dog in the house to begin with because of her looks but this beauty began to radiate from this dog who had only known starvation, cold, pain and unkindness. All she needed was a little nurturing and a beautiful flower grew. Trista never put on any weight, so after a trip to the doctor we learned she had a heart arrhythmia and that she could die in her sleep at any time. That is what happened today, 6/17/2008. I have had many pets in my life but none were as beautiful as Trista. You will forever be in our hearts and never forgotten. We will pass on your love to other animals that have never felt love. His name fit him perfectly since he was bigger than life! 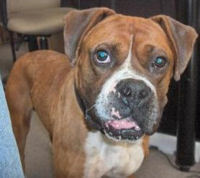 When we first adopted Zeus, I would lie next to him; I would pet him and kiss his beautiful face. Zeus wasn’t quit sure what to think of me and all the affection I gave him. After about 2 months of loving on him he realized how much he loved being loved and couldn’t get enough. 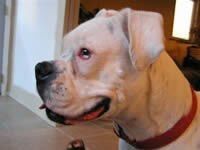 From the moment that Ruka, our 16 month old Boxer, saw Zeus it was love at first sight. We would take the Boxers on long walks and everyone we passed couldn’t help but stop and stare at the beautiful creatures by our side. 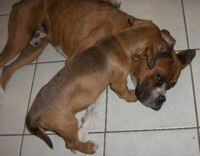 We will never forget Zeus and the love he gave us and how much he loved our little Ruka. You will always be my big, strong, handsome, sweet boy. I wasn't anywhere near finished loving you but I am grateful that I was the one chosen to be with you. I think your guardian angel knew that you needed and deserved a Mom who would never lose faith in you and who would never leave you. Thank you for making me feel special everyday. I'll never forget how you gently kissed my leg every morning as I got your breakfast or how you loved to take naps with me on the couch. I loved the way you took treats from my hand, so gentle you would leave the tips of my fingers wet. Then there were the mornings I awoke to find your head in the bend of my arm and I knew we were going to have another wonderful day. I can't find my heart now but I know it is somewhere with you, keep it, it's yours. His Name will always be Paco and he will always be in our hearts. I had always wanted a Boxer and getting a new puppy is fun but there are a lot of dogs out there that need a good home so we were off to Boxer Rescue. 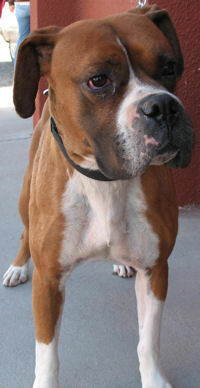 We met several Boxers but when we went to Doug’s and met Paco he was the sweetest most loving dog that you could ever ask to meet. He had a hard but unknown life—most recently being nearly starved to death—but you can read all that under 2004 adoptions. He bore marks on his forelegs and bite marks on his quarters so he had endured a lot. But there was a kindness and gentleness that was his core soul. We took him on one of Doug’s famous “test drives” that really means give the guy a chance to steal your heart—which Paco surely did. He would remind you to love him by gently snuggling under your arm with his cold nose as you sat in a chair or at the computer. Never demanding, just a gentle nudge to let you know he needed a hug—often. He never liked other dogs much—until one day when he met Mia. 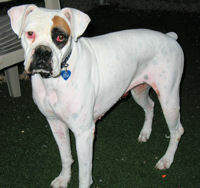 She was at a Boxer Rescue event where we stopped in to let Paco visit with Doug and his family. Doug introduced Mia to Paco and he readily accepted her, so we were off on a second test drive. 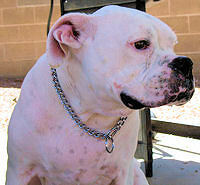 Paco was with us just over two years before the wear and tear of a hard life took its toll. Paco shared his home with Mia, as well as his beds and his toys. They were great pals for about 4 months—then Paco fell ill. 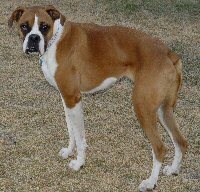 It was almost as if Paco knew his days were numbered and he wanted to leave us with another Boxer he deemed “suitable” and he picked very well. This website asks “Adopting a Boxer, what is in it for me?” my answer is some of the best friends you will ever meet—what more can you ask for in this life? Rest in Peace our friend. Holly, you gave me so much joy. You were truly a blessing to me. I loved every minute I spent with you. And I will always cherish our time together. Your nubin’ never stopped wriggling. I will miss you little girl. 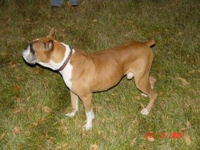 To those of you who did not have the opportunity to meet Beans, he was a marvelous Boxer who's original owners turned their backs on him after 9 years. 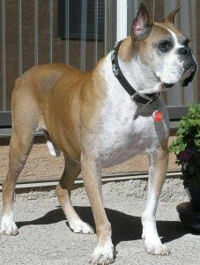 He was initially fostered by Dana who's heart was immediately captured by this wonderful boy. He then went to his forever home. 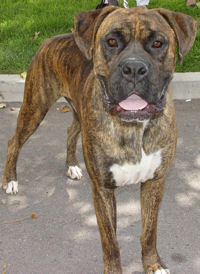 Bill and Janice and their female Boxer, instantly fell in love with Beans but were only able to cherish and love him for about eight months. Not very much time to spend with such a wonderful boy. Yes sadly, Beans left us due to cancer. He never gave up on people, he continued to give all his love to anyone who crossed his path. 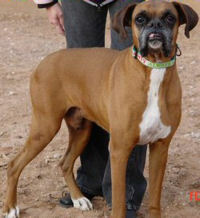 He touched the hearts of everyone in Boxer Rescue and at Animal Humane. Beans will be sorely missed by his family; Bill, Janice, and his newest sister. God’s Speed gentle one and run free at the bridge. Thank you Bill & Janice for making a difference. We didn't know him but for a few days. He was pleading for help. Help his owners never gave him. He was very sick but managed a nubbin wriggle when he saw you coming. 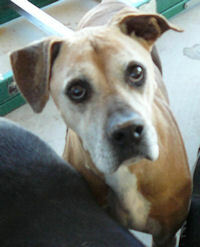 His days at the Rio Rancho Shelter were filled with love, a caring young lady named Jessica. Thank you Jessica, for loving him and sneaking his favorite treat ..... donuts. His heart was as big as Jupiter. But his cancer was insurmountable. Bailey we're sorry, and we'll miss you dearly. Della was such a sweet girl. She came to us as a surrender. 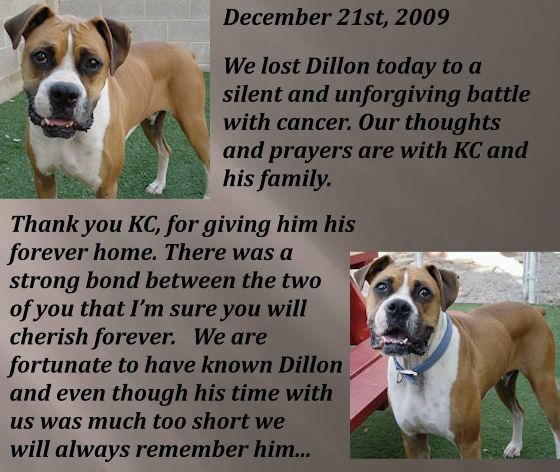 We were never able to determine how such a wonderful dog could be cast aside and forgotten. She was in a great deal of pain but never really complained. Despite the extensive surgeries and the long recoveries, she had a wonderful personality and outlook on life. 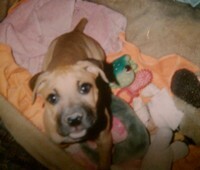 She loved to play with Rocky and Cheyenne and her foster Mom and Dad. Thank you Stacy and Richard, her final days were filled with love and kindness. Thank you Della for showing us your unconditional love, we'll miss you. Thank you Stacy and Richard. Jack was my second foster dog and he came to me loaded with surprises. When he first came to my home, he was scared, in shock, and very nervous. 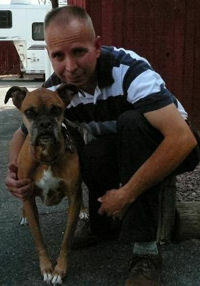 He taught me a lot about how to deal with "damaged" dogs and I will be forever grateful to him for that alone. Through the course of the six months he was with me, he went from a frightened animal to a fairly confident one. It was obvious from some of his behaviors that this boy had lived a very rough life in the short year or so he was on this earth. 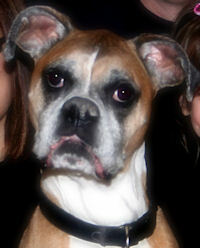 When at home with me, he was the most cuddly and loving boxer boy you could ever ask for. He loved being close to me at all times and would just hop up into my lap at every opportunity. I will always remember this loving soul and thank him for the things that he taught me. God Speed little one.